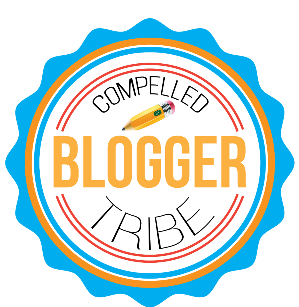 The Compelled Educator: What Do (or Should) Classrooms Look Like in the 21st Century? What Do (or Should) Classrooms Look Like in the 21st Century? This summer, my friend and then co-worker, Holly Sutherland and I would take walking breaks during the day to get in our miles for the #500in2014 challenge and also have informal (but informative) PD chats while we walked. Our school is so large that from our offices to one of the ends of the building on the same floor is about a quarter of mile. We got in some good mileage in those days! On one of those walks, I shared with Holly that I wanted to write a blog post about classroom spaces - specifically, what difference does the space make, if any? I finally wrote it and today's the day to publish it. 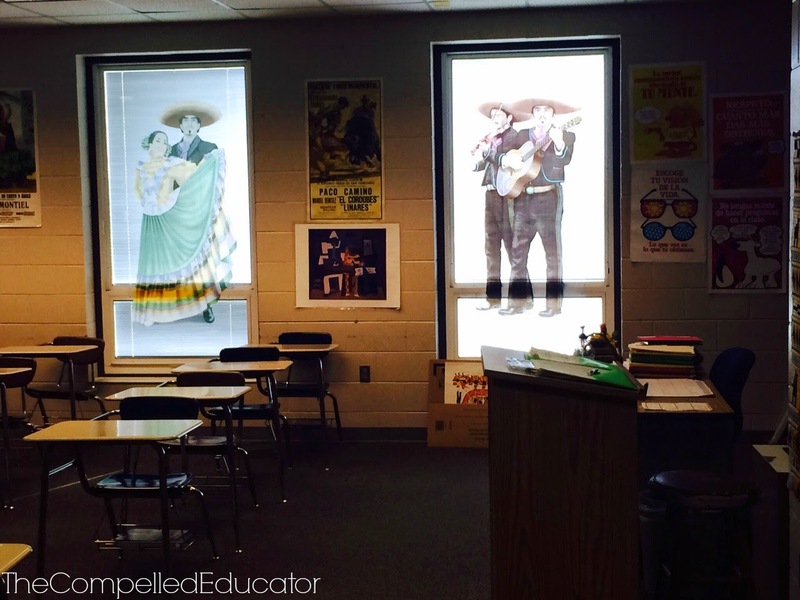 How important is it that a classroom is decorated... or not? Do high school students need visual stimulation? Do students care if the room is decorated or not? After doing my administrative internship about 12 years ago (part of it in an elementary school), I saw a lot of classrooms with almost every bit of wall space taken up with something to stimulate the senses. I've joked since then that kids have more attention issues today because of kindergarten classrooms. A recent study in Psychological Science suggests that highly decorated classrooms may be related to off-task behaviors and lower test scores. I was only half-joking, but what I think of is the principle of blogging and page design of using whitespace. Having the negative space focuses the eye on the content and creates drama and contrast. 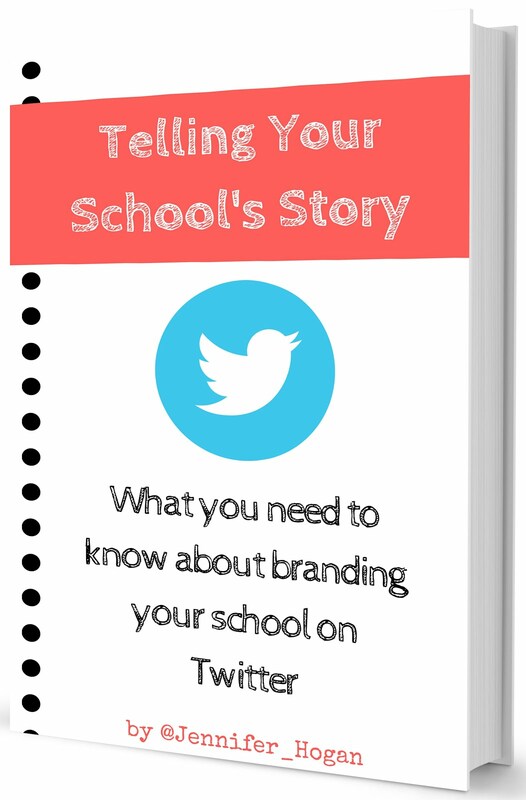 How important is it to have "whitespace" in a classroom? We have over 200 teachers at our school, and not every classroom is decorated. In fact, there are a few that have nothing on the walls. Instead of posting those pictures, I am sharing with you a few pictures of some of our classrooms that I believe say to students, "Welcome to this class!" This is a science classroom. Would you find this visually stimulating or distracting? What kind of first impression do you think this made on students on their first day in this classroom? Can you guess the subject that is taught in this classroom? 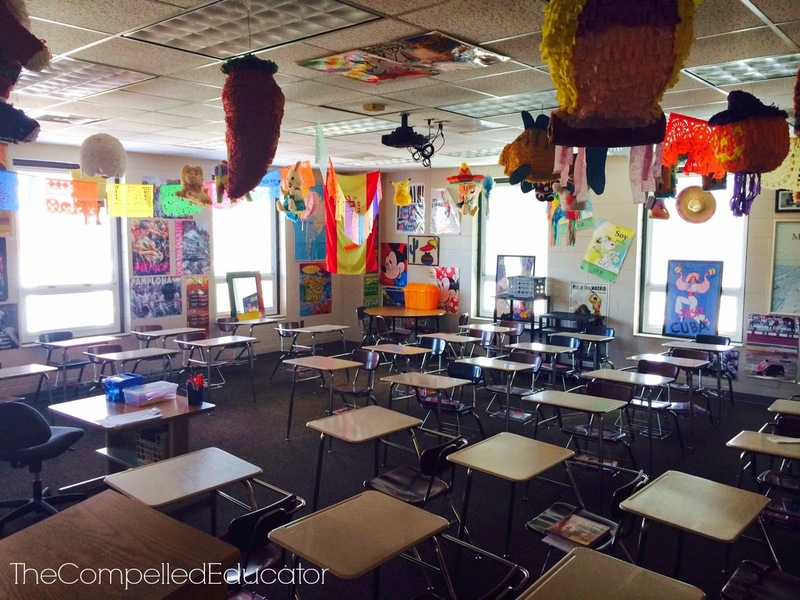 What do the pinatas add to the atmosphere and mood in the classroom? Distracting or enhancing? Some of our teachers use ceiling tiles as spaces to demonstrate knowledge and learning. 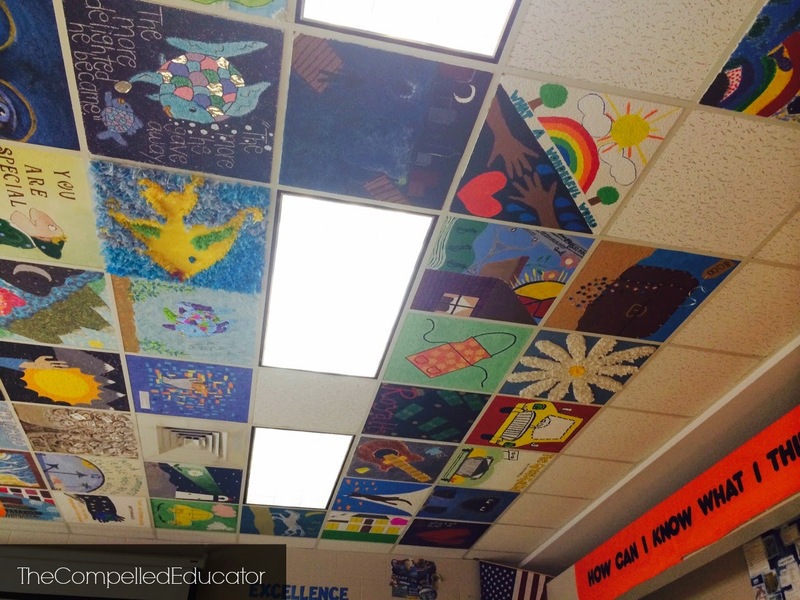 Are teachers allowed to decorate the ceiling tiles (or have them decorated) in your building? This is a different Spanish classroom. I just love these vinyls that are on the window. It adds such a neat effect to the classroom. 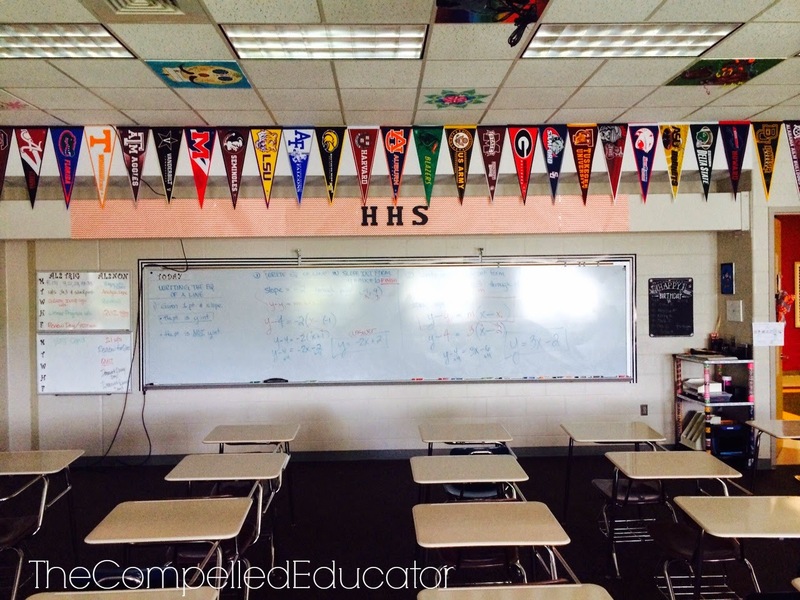 I really like how this teacher hung college pennants in her room. How would this be important in a high school classroom? What does this say about the culture of our school? The two pictures above are from a classroom where freshmen English is taught. I LOVE that our freshmen have such an inviting space to go to. I also love the reading corner. 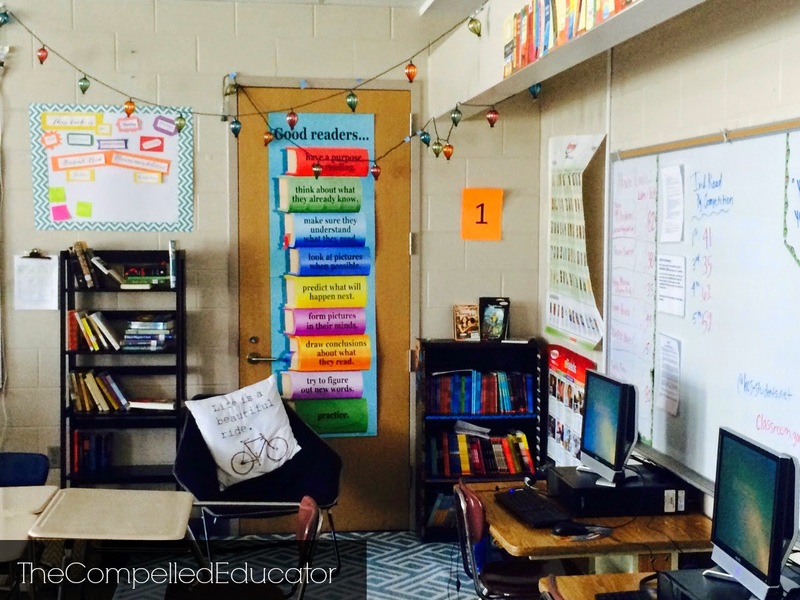 What message does the teacher send by having a dedicated space for reading in her room? 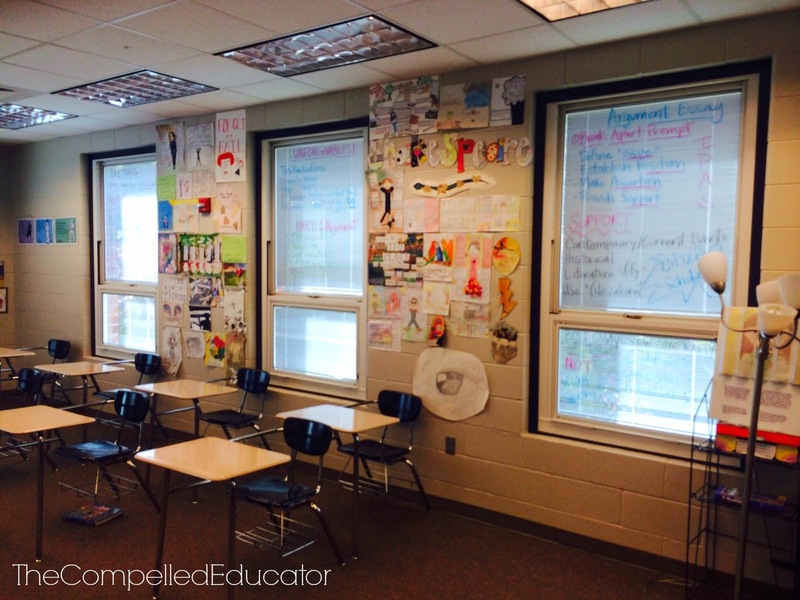 The picture above is an English classroom that displays student work. The teacher also uses whiteboard markers to use the windows as messaging space. Unfortunately, I don't see a lot of classrooms that display student work. What does this say about what we believe about authentic audiences for students and student voice? This classroom displays an oversized Pyramid of Success by John Wooden. 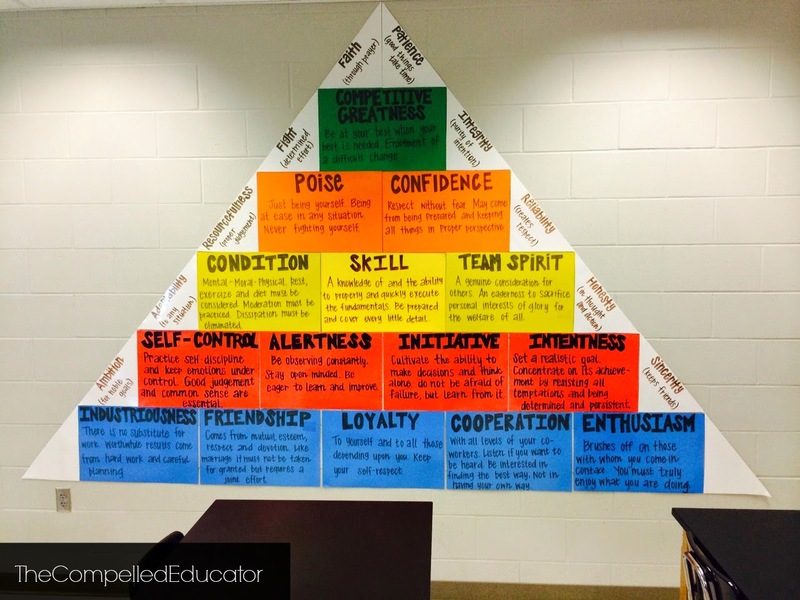 The teacher in this room lives and teaches the characteristics found on this pyramid. Is it important to have features such as this in high school classrooms that emphasize character? This post is filled with questions. It's because I believe physical space is important and has an effect on mood and motivation, and I'm curious if it IS important. Maybe there is some research on it like the kindergarten classrooms. 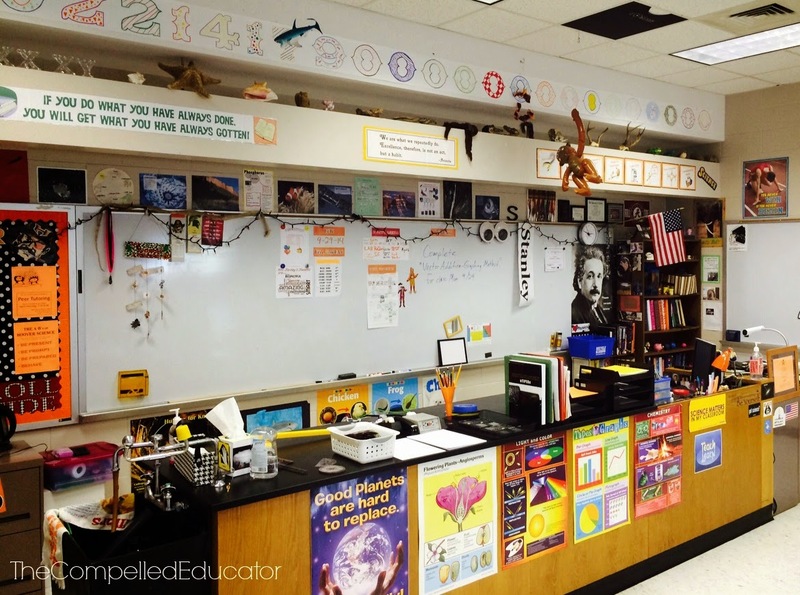 In a high school classroom, should we have only decorations that have a purpose to learning? Can a room have too much decoration? 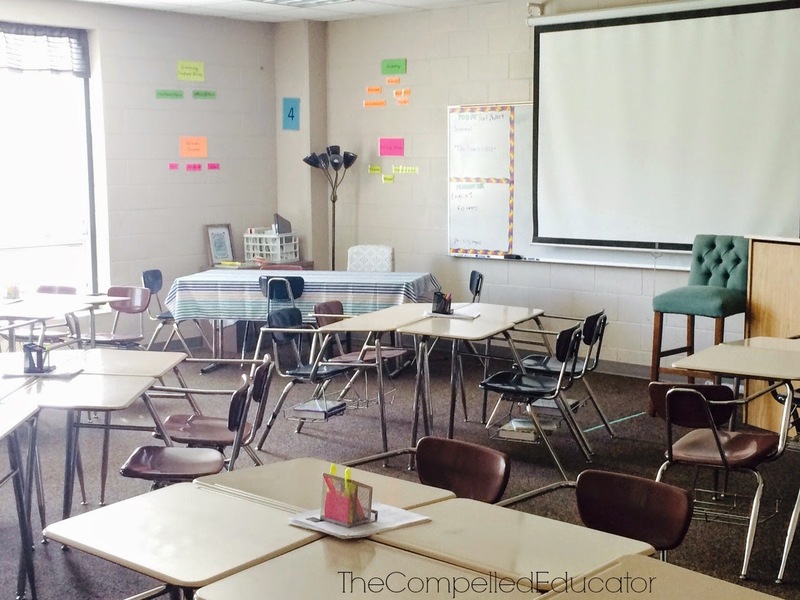 Should teachers be required to decorate their rooms? What would be the minimum? I think kids want to sit in an inviting space each day. I think they want the decor to be relevant to them, too. I believe that if we value students and their experiences, we need to create spaces that promote learning, attention, and interest. Wonderful food for thought. I agree that how a teacher decorates their room reflects what they value, ie. student work, reading, college, etc. 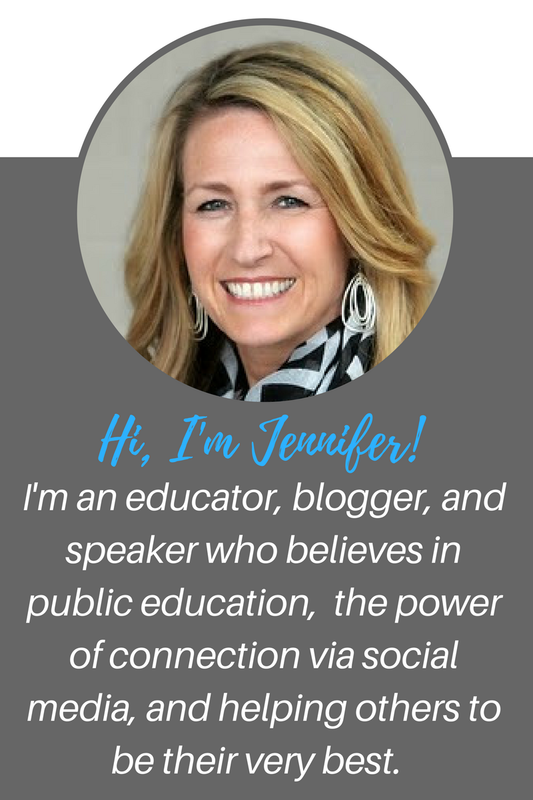 This article leads me to reflect, what message am I sending my students? Great post! I wish more people reflected on this topic. As an elementary teacher (primary) with a special education endorsement, I believe poor classroom decoration can lead to student distraction. My personal philosophy is I do not hang anything up on the wall that was not made by a student or as a class. Many posters (like quotes) I see hanging in the classroom are rarely referenced throughout the year. We need to be tasteful about how we decorate our classrooms. It is OUR classroom, not just the teacher's. I have seen rooms where it looks like Pinterest threw up everywhere. I don't believe in themes (superheroes, etc), but a classroom should look uniform. Although a classroom should be welcoming, students will not remember decorations 20 years from now. Students remember experiences. I totally agree- over decorated classrooms are counterproductive towards learning and understanding for all students. I recommend that teachers remove all materials at the end of the year and replace new and updated materials on the walls for the next school year. Nothing says "I'm not learning" as a teacher like yellowed newspaper clippings and antiqued motivational posters all over the place!